Extending Beltway toll lanes over the Potomac River sooner, changing D.C.'s streetcar plans and widening area roads are just some of the transportation projects that got the green light from a local transportation planning group. D.C.-area officials said these projects can actually be constructed in the coming years. WASHINGTON — Expanding and extending Beltway toll lanes over the Potomac River sooner, delays and changes to D.C. Streetcar plans, and changes to widening plans for a number of roads across the region. Those are some of the transportation projects that moved forward to be part of long-range plans that can actually be constructed in coming years. Other projects accepted Wednesday as having the funding to move forward include an additional lane by 2025 on Interstate 95 south just across the Occoquan River to exit 160, and a plan to widen Route 15 from Battlefield Parkway to Montresor Road near Leesburg. The Metropolitan Washington Council of Governments’ Transportation Planning Board approved the projects for a final air-quality conformity analysis before additional public comment in September. Final plans will be approved in October. Projects must be in the regional plan to qualify for certain funding, and the timelines in the plan for each project are required to reflect what each jurisdiction can actually complete given construction timelines and funding availability. The revisions to those timelines presented Wednesday from across 19 different state, locally and regionally funded groups reflect a number of important changes and updates before a final air-quality analysis. Including maintenance and about 650 new regionally significant projects, the region expects to spend about $300 billion on transportation through 2045. Maryland is proposing the addition of $7.6 billion in toll lanes along the entire Maryland portion of the Capital Beltway and the length of Interstate 270 by 2025. The state has not promised that HOV users would ride free as they do in Virginia, but that free rides for cars with at least three people is being discussed both for transportation purposes and the simplicity of similar rules across the region. In response, Virginia now plans to extend both of its existing 495 Express Lanes to the Legion Bridge to provide a continuous trip around the Beltway. The Virginia extension is estimated to cost about $500 million that could be split between the private toll operators and state funding. Previous Virginia plans called for extending only a single toll lane each way to the bridge. VDOT’s Renee Hamilton said Virginia is explaining to Maryland lessons from Virginia’s toll lanes, including Interstate 66. Maryland is not prepared to include a suggestion yet for toll lanes along the Baltimore-Washington Parkway since it is not clear the federal government would permit it. 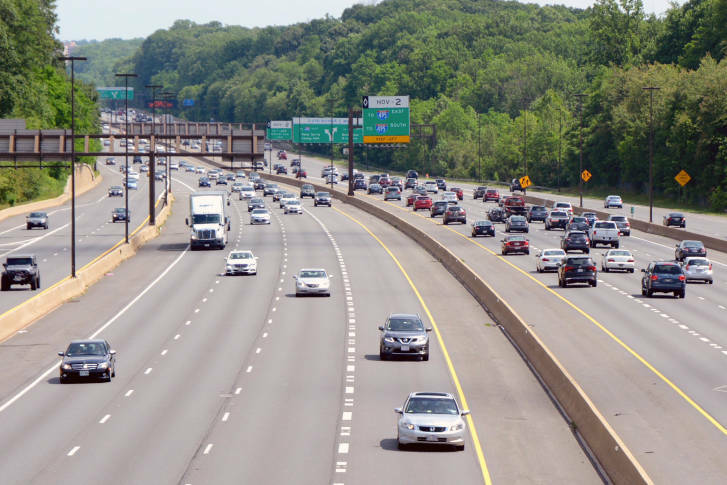 For now, Maryland is meeting this week with private companies interested in designing, building and operating the toll lanes on the Beltway and I-270. The lanes could potentially be opened in phases, and may or may not be put in the center of the highway, Maryland Deputy Transportation Secretary Earl Lewis said. “There will be the same number of lanes that are non-tolled after the project as before the project,” Lewis said. The exact designs are not expected to be finalized until after a contract is awarded to a private company or group of companies by 2020, Lewis said. Federal environmental review rules require public comment during the design period. Due to the inclusion of the toll lane plan, Transportation Planning Board members from Greenbelt and Takoma Park voted against the project list. They said they are concerned that adding more lanes, especially without additional transit options, could increase traffic on local roads and disrupt communities. Maryland will still offer alternatives, Lewis promised Roberts and others skeptical of the toll lane plan. “There’s not a silver bullet here,” Lewis said. The District is essentially canceling plans for streetcars in Anacostia and along M St. in Southeast and Southwest by moving them to the aspirational part of the transportation plan rather than the section that is funded for construction. D.C. does plan to extend the existing H Street streetcar to Georgetown by 2025, three years earlier than the previously updated plans. The line’s extension just across the Anacostia River is now planned to be completed in 2023 rather than 2020. The District also canceled the idea of extending the Union Station-Georgetown DC Circulator route up Wisconsin Avenue NW to the National Cathedral. D.C. is planning a number of new bike lanes across the city and expects to complete 16th Street bus priority improvements by 2020 rather than 2021. The separated bike lanes include Pennsylvania Avenue SE from Independence Avenue to Barney Circle, 17th Street NW, K Street NE and NW, Irving Street NE and NW and New York Avenue NE from Florida Avenue to Bladensburg Road. Maryland has also proposed widening U.S. 301 ($4.6 billion) and Md. 201 ($1 billion) by 2045, widening a small stretch of Md. 97/Georgia Ave at the Capital Beltway ($52 million) by 2025, reducing the widening plans for U.S. 29. Maryland also proposed indefinitely putting off plans to widen Md. 27. The U.S. 301 widening all the way from the Gov. Harry Nice Bridge to U.S. 50 would coincide with construction to widen the Nice Bridge crossing. Montgomery County wants to officially include plans for Bus Rapid Transit on Randolph Road ($102 million), between Montgomery Mall and White Flint in North Bethesda ($115 million), from Bethesda to Clarksburg along Md. 355/Rockville Pike ($1 billion) and Veirs Mill Road ($80 million). On Wednesday, the county also added a request to make New Hampshire Avenue bus rapid transit part of the plans by 2045. The first of those lines could be in service by 2030. Plans to widen Monocacy Boulevard in Frederick County, Md. ; Rolling Rd. in Fairfax County; and U.S. 15 in Loudoun County are just some of the other roadway projects in the long-range plan. Two people who live along the Route 15 corridor asked the Transportation Planning Board to hold off on including the $33 million widening project there in long-term plans, instead hoping that removing traffic lights in favor of traffic circles could help address some of the rush-hour backups there. “A four-lane road north of White’s Ferry Road may not even be necessary,“ Harriet Dickerson told the board. Dickerson is an owner of the 600-acre Rockland Farm LLC just north of Leesburg that is also used as a wedding venue. It is split by Route 15 north of Whites Ferry Road, which she said she hopes the Virginia Department of Transportation will only partly widen. The 3.6 mile widening north of downtown Leesburg could be completed by 2025. In Maryland, the City of Frederick and Frederick County are concerned a widening of U.S. 15 there is not currently planned to be completed until closer to 2030 even as new toll lanes up I-270 could put more traffic in the city. Among some of the changes presented Wednesday, a Route 7 interchange at Va. 690 west of Leesburg would now be constructed in 2025, rather than simply being looked at for study. Metro submitted a $5.4 billion plan to operate all eight-car trains at rush hour and improve key stations. That would require significant upgrades to power systems and some improvements at busy stations to handle the additional crowds. Editor’s note: An earlier version of this story misspelled Montresor Road. It has now been corrected.